2015 is truly shaping up to be the year of proximity, mainly driven by the explosion of beacon technology at the retailer level, with installations now moving out of pilot phase, and an estimated $4 billion of sales from top US retailers directly driven by beacons (a figure that is expected to climb tenfold in 2016). That said, we are still a young industry figuring out the optimal business models, privacy regulations, technical solutions and how to create interesting and high-value end user products and communication. The proximity industry is naturally a fragmented one. This is not surprising as a young industry, but it's also due to the fact that proximity hardware has to be physically deployed and that software solutions are increasingly being tailored to industry verticals, that being retail, sports, transportation, museums or others. Our last count tallied up to over 150 PSPs (proximity solution providers) globally, and the number is likely well over 200 by now. No wonder, as it is a low investment in both time and money to buy or produce hardware and build a bare bone CMS solution. The increasing amount of PSPs is at the same time both the strength and the weakness of our industry, as it guarantees rapid growth but potentially with some less than optimal products, coupled with the risk that some end users and customers might not experience the full potential that exists in proximity. As argued by Thomas Walle in an earlier post here on the Unacast blog, it is vital for us all to look ahead into the future of the proximity industry, and prepare for what is to come. And the main challenge we work to solve at Unacast is the fragmentation itself. The (natural) focus on industry verticals also means that each of the PSPs and therefore the retailer/brand have a fairly limited customer view. As soon as the customer leaves that specific physical location, he or she is again invisible, until they resurface in the same location (or the same chain of locations). What the customer did before and after the visit is unknown. This diminishes the smartness and accuracy of the targeted in-store campaigns that the PSP and the retailer/brand can deliver. Online communication delivers rich data quality and quantity, cross-channel relevance and ubiquity, where campaigns and communication take into account the users’ more complete online profiles. In order for proximity communication to reach the same potential and to create equally complete offline profiles, we argue that it is necessary to think of the proximity industry as part of a network, with the different retailers, brands, and PSPs all interconnected on a technical level. That will obviously take time to fully realize, but the work starts now. The proximity industry is a young industry, and it is quickly growing up. And all the small individual atoms have the promise of adding up to a colossal construction. At Unacast we think of the interconnection of physical proximity hardware, like beacons, as the blood veins of the Internet of Things; something that has the potential of being far bigger than, and equally revolutionary, as the Internet. One of the great limitations of working with targeted communication today, most often in the form of ads, has been the disconnect between the physical and digital consumer. This is why marketers globally have labelled it “the holy grail of marketing”. The physical consumer is today seen in-store (only) and greeted with mass communication like posters or asynchronized communication like emails, notifications or text messages (not connected to the user’s location), while the digital customer is naturally seen only in digital domains. The advantage with digital channels, as argued above, is the data quality and quantity, cross channel relevance and ubiquity, meaning that the communication is over time more relevant to the specific customer. As an average user is 30% online and 70% offline of their awake time, we can, by including offline data that reflects the customer´s behavior and interests, reduce the amount of perceived irrelevant information online, hence further reducing spam. We have all had a certain ad linger around for way too long, and more relevant data and smarter targeting is the solution. The obvious challenge here is that the offline customer and the online customer might very well be the same one, resulting in inefficient spending from the advertiser (which typically is the retailer/brand themselves) and a substantial limitation in campaign possibilities. Again, facilitating the bridge between offline and online data through proximity technology is of great value in itself, but to truly fulfil the full value of proximity marketing and the proximity industry as a whole, we need a greater sense of the offline profile than the ones gathered within the silos that are specific physical location. For example, Unacast is currently working with a number of shopping malls. Malls are ideal candidates for proximity technology as they have a lot of customers within a confined physical space, with several retailers and brands that want and need to communicate with these customers. At the same time, they have to be careful to send relevant communication and hence avoid spamming customers. The offline to online bridge provided by Unacast enables malls to continue to communicate with customers after they leave the physical location and go online, for instance by allowing the relevant brands and retailers to retarget their relevant subset of customers. However, it is only by working in networks that a mall can understand what their customers do beyond their walls, before and after the visit. This knowledge enables the mall to be smarter when customers are entering the physical location or going online, and tailor the communication to fit that particular person. For example, when a 30-year-old male with an offline history related to visiting sport stores and football stadiums in the last two weeks (derived from data from Unacast´s network) enters the mall, the customer should receive a communication that reflects this interest and history outside the mall. By sending proximity messages with little relevance, the mall may miss out on revenues and worst case risk that customers opt out from future proximity communication. By tapping into the strengths of the network, shopping malls can ensure they extract the full value of proximity technology, also to the benefit of end users. 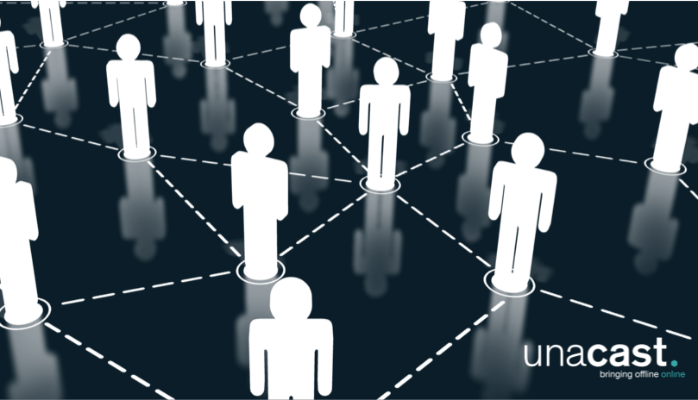 The full potential of proximity is not something any one of us can fully grasp yet, it is simply too early, but at Unacast we are convinced that the network will be the catalyst of this potential. This is why we have teamed up with some of the most prominent PSPs globally and are together with them expanding the boundaries of proximity; as part of a network. Unacast will at SXSW the 14th of March disclose new global strategic partnerships and launch new network products to power the emerging proximity industry. Reach out at hello@unacast.com if you want to meet up or know more.